A drive through California with photographer Stefan Bogner reveals why his pictures of curves are so unique. They are purist in the extreme. They allow but one thing beyond the roads and the backdrops—the new 911. The rugged Panamint Range beckons on the horizon. Nothing but curves frame the craggy cliffs. Stefan Bogner is sensing that special moment again. The yearning that overwhelmed him several years ago when he first created Curves magazine. “Only in a car do I really find peace,” he says. An uncompromisingly artistic photographer, he sees only two options whenever he flees the bustle of everyday life: standing behind a camera, or sitting behind the wheel. Preferably both, in rapid succession. When choosing his backdrops, Bogner is more willing to compromise. A native of Munich known for his work in the Alps, he has long had California in his sights. But he didn’t have the right set of wheels. “You can’t take the mother of all road trips in any old car. It has to be a 911,” he says with what must be the same smile he had as a boy whenever he heard a Porsche motor running. So he and his dream road waited for the best 911 of all time—which is traditionally the newest—namely, the 911, Type 991 II. Preferably a Cabriolet, with the sense of freedom it offers. Just the thing for the American dream. Up against the edge of the West. No other place seems more appropriate for “generating impressions and evoking memories and desires in order to interpret them anew.” We start off in Los Angeles, the cultural center of California. Without a plan. With the goal of not having a goal. No obligations. No rush. Just being on the road. With his finger on the shutter, Bogner begins his search for his melodies and his sound. The song of soulful driving, that feeling of freedom in the midst of curves, of being on the road with friends. Like the days of yore in his band. Today his fingers do not caress a keyboard, however, but rather a Nikon and a Leica. They compose scores made of curves and dreams, images of a nearly infinite emptiness, filled with desire. His song carries us up Highway 1 to San Francisco. The summer of love. No flowers in our hair, but sunlight all around. Silicon Valley is just a few kilometers away, and we can sense its winds of change. A Porsche 911, a surfboard, and the Pacific Ocean bring you very close to the California dream. A place of the future. Its experts spend their days working on virtual new worlds, then head out into the real world to surf. The real world of the San Francisco Bay Area. We too leave a trail on the Pacific coast—on the asphalt, riding a current generated by six cylinders and three liters of displacement. Bogner philosophizes about the Cabriolet as a surfboard on the road. The longer we listen, the more eloquent he becomes. 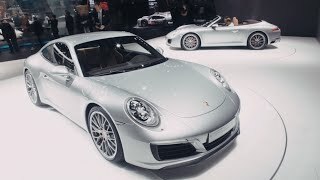 The new 911—“perfected yet again and even more precise than its predecessor”—suddenly morphs into the karma of his life. 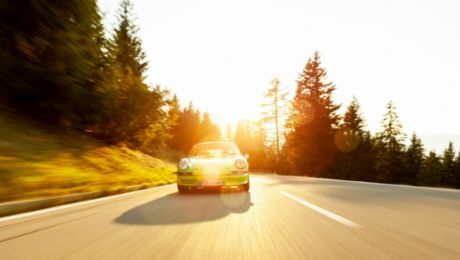 Indifferent to such musings, the 911 with its turbocharged boxer engine glides through the landscape. Familiar yet refreshingly different: 10 millimeters lower to the ground, freshly styled with vertical slats in its rear bumper, defined by its new taillights. Above Death Valley, with its unending straight stretches, he desperately searches for curves, or some type of anchor. Las Vegas follows, then the Hoover Dam, and finally the Grand Canyon. Shortly before the Mojave Desert he is back on the ground. And takes the wheel again. Of course. The aerial excursion has fueled his enthusiasm for the boundless beauty of this land and this trip. For its unworldly curves and its uninhabited spaces. We agree that the term “aesthetic travel” certainly applies here, perhaps in the sense of Johann Wolfgang von Goethe’s eighteenth-century journey through Italy. But we are now in the twenty-first century, in what might be its most beautiful form. Silence. Space. Emptiness. Bogner’s photographs require no fixed points in the form of people, who are expected to take the role of viewer. As he puts it, “You can enter the images, and find yourself in them.” He does not modify any of his subjects, yet they all share a certain look. “A little on the gritty side, and fading off in some parts if possible,” he says. He is just as much a purist when it comes to editing the images. Contrasts, depths, and dark tones are emphasized. Nothing more. “The idea is to capture feelings.” In Europe, Bogner often uses a super-wide-angle lens, but not in the United States. “The landscapes here are so much more expansive than a valley in the Alps,” he remarks. On occasion he switches between his Nikon and his Leica, between a lens from Zeiss and one from Leica. After a few days in the Mojave Desert, Joshua Tree National Park, and Palm Springs, we head back to Los Angeles. More specifically, to Venice Beach, where we take a dip in the ocean. Look at photos. Talk about curves. Almost like being back in math class at school. Sine waves, maximum and minimum turning points—and, of course, inflection points. Tangents that might never meet in the distance. Or perhaps they will. So many vibrant memories, so much pleasure on the road. And that gives us an idea—we’ll keep on driving. Stefan BOGNER (47) is author and photographer for Curves magazine. Curves. USA – Kalifornien is published in German and English. For more information: www.curves-magazin.com.